So says Esma Redzepova Teodosievski as we talk all things Gypsy over scalding Turkish coffee. It’s an entertaining suggestion and, undoubtedly, carries a certain logic; the Memphis Flash’s tan beauty, gentle nature and ability to blend and reshape any music he inhaled is symbolic of Balkan Roma. Any truth to it? Where Esma’s concerned, simply print the legend. More importantly, I imagine Esma’s making a connection of sorts; she being the Queen of the Gypsies, Elvis the King of Rock‘n’Roll. Think about it: arising from 1950s urban poverty, Elvis galvanizing poor black and white Southern US music, Esma reinventing Roma and Slav music(s) of the southern Balkans, two adolescent sirens who sang and danced with a bewitching freedom. Before Elvis and Esma white trash and Roma women had no cultural presence, existing only as caricature. E & E proudly marked their peoples on the world map. What others deny Esma takes pride in, taking the Gypsy soul experience across the globe, impressing all who encounter her. A force of nature? Indeed. Esma’s tiny, a plump bundle of energy whose unlined features are a testimony to a life free of cigarettes and alcohol. Today, as ever, she’s charming and immaculately turned out. I’m shaved, sober, on my best behaviour. Even though we don’t speak the same language – she’s fluent in Romani, Macedonian, Serbian, Turkish. I speak English and minimal Spanish – we get on well, communicating easily, her nature being funny, wise, affectionate. And I . . . well, I have a tendency to get effusive in her presence. Esma listens, Oriental eyes sparkling, mischievous smile playing on her lips. “You’re a honey,” she says. Then winks at me. Oh Esma! Esma recalls home consisting of a room, anteroom and yard in Skopje’s old town. They were poor but not so poor as most of their neighbours, many of whom still lived in mud huts. Education was emphasised by Canija with all six children finishing primary school. 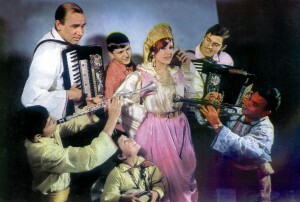 Aged nine, Esma was introduced by her brother Fari to Skopje Romaines Pralipe (a local Roma music organisation). “I was quick to pick up even the most complicated rhythms,” says Esma. Canija encouraged Esma’s musical gifts and Fari helped her join an amateur folklore group in the Tito Metal Works. In the summer of 1957, while attending a contest in Saraj (a town outside Skopje), she was invited to sing at a talent contest Radio Skopje were sponsoring. Esma entered. Esma won. Forty-six years on she’s given over eight thousand concerts, written and recorded hundreds of songs, released dozens of albums, shifted countless units.